trustworthy definition. We’re all familiar with air transportation, the straight-and-level flight and gentle turns and changes in altitude that bring us from one place to another. By contrast, most of us have at least some notion of the abrupt maneuvering that typifies crop dusting, barnstorming, or dogfighting. But where exactly do we cross the threshold from one kind of flying to the other? Pilots have no need to think deeply about this, a rhetorical question. However, to make better use of the word, let’s say aerobatics is the intentional departure from straight-and-level flight in order to perform maneuvers involving extremes of bank, pitch, and acceleration. Aerobatics started unintentionally when, in 1913, a young Frenchman named Adolphe Pegoud tried parachuting out of his airplane. Already people had parachuted from tethered balloons, but no one had yet jumped successfully from an airplane. Luckily for Pegoud, his parachute opened, but what his fragile Blériot monoplane did after he abandoned it was even more remarkable. Until that day, pilots mostly flew straight and level, making timid turns as needed for course adjustment. Aircraft were expected to come apart if subjected to anything more demanding. But after he left it, Pegoud’s aircraft twisted and tumbled, rolled and turned, soared and dived, apparently none the worse for wear, until finally crashing into the French landscape. Watching in his parachute and from the ground, Pegoud resolved to duplicate the maneuvers in manned flight, and aerobatics was born. Amazingly rapid progress was made in expanding the aerobatic repertoire. In the beginning, spins were little understood, the spin thought to be a death sentence. A Brit, Wilfred Parke, managed purely by chance to recover from one, afterward remembering what he’d done and writing it down. Pegoud approached aerobatics in a more systematic way. 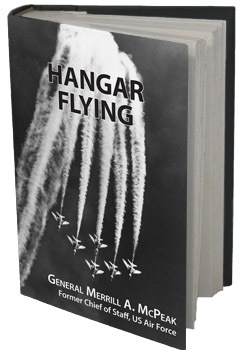 He was the first to perform many maneuvers, including inverted flight, for which he trained by suspending his aircraft upside down in a hangar. This experiment led him to invent the modern style of lap belt and shoulder harness. However, the honor of being the first to do a loop probably belongs (by a few weeks) to Peter Nesterov, a pilot of the Russian Imperial Air Service. Near the city of Kiev, Nesterov climbed to 3,300 feet in a Nieuport monoplane, cut the engine to prevent overrevving the prop, dived a thousand feet or so to build some speed, pulled up sharply into the beginning of the loop, restarted the engine and kept pulling until he went completely over the top. Then he shut the engine down again and glided to a landing. He was arrested and held 10 days for taking undue risk with government property. It was well into 1904—the better part of a year after their first flight—before the Wrights could horse their flyer around a level 360-degree turn and land back at the takeoff point. It’s hard to believe that by January 1914, less than a decade later, enough aerobatic pilots existed in the world that a dinner could be held in London of the Upside Down Club. Courses were served backward, starting with dessert, and a singing waiter entertained while standing on his head.